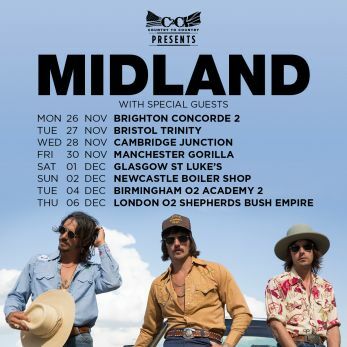 Delighted to welcome Midland to Concorde 2 this November! Tickets on sale Wednesday 14th March at 9am. Rooted in tradition both in sound and style, Midland initially garnered attention playing clubs in the Texas region. Their self-titled debut EP features five tracks, boasting songwriting credits from each member. Midland intentionally nods to the wild west with Country music that is reminiscent of the 1970s and 80s with a modern day twist. They’ve opened for idols Dwight Yoakam and Willie Nelson and are currently in the studio with Shane McAnally (Sam Hunt, Reba McEntire, Kacey Musgraves) working on their full length release for Big Machine Records.